It's time again for my favorite swap ever! The Pillow Talk Swap. There is so much talent in this group. I am amazed and inspired every single time. Here's what I made for round seven. I chose the deep jewel tones of Heirloom by Joel Dewberry for my partner and I paired it with Essex in gray and Kona in cerise. If you were online on Sunday you may have seen some sneak peeks. I was posting pictures as I worked. 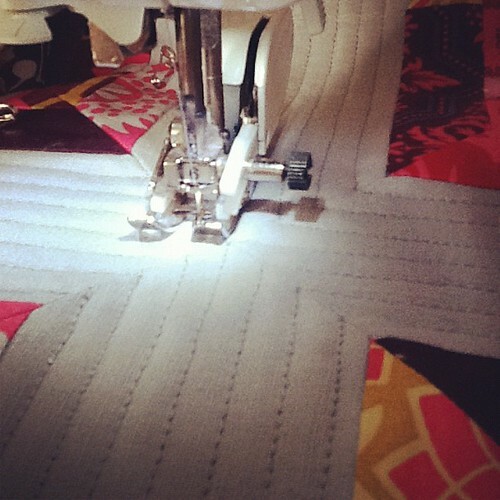 Hey, it's a great excuse to get up and stretch while you're sewing. Whichever way you press your blocks, do it the same for all of them. Otherwise they don't match in the end. D'oh! I had to remake two blocks after learning this the hard way. This picture shows my preferred way to press these blocks. To the side for the strings, and then open when you join the blocks. This pillow did talk to me. 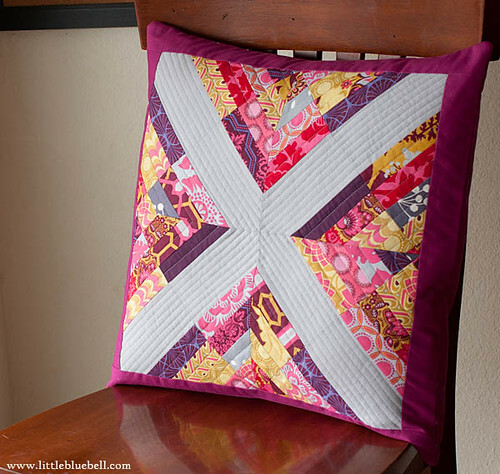 It whispered how it wanted to be quilted. 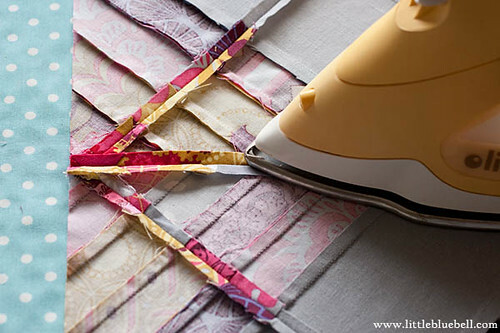 Close lines on the linen, looser lines on the strings and leave the border alone, ok? This might look familiar to some of you. This is an original design that I shared for a quilt back in October of last year. I have more Heirloom and I'd love to make a larger version of this someday. The original had white crosses, but I really like how the gray Essex looks. I hope my swap partner loves it!! very pretty, adrianne! i am loving the colors here! Why did you get all the talent?! This is awesome. I love your colors. Wow, it is sooooo pretty, love it. It's perfect, Adrianne. 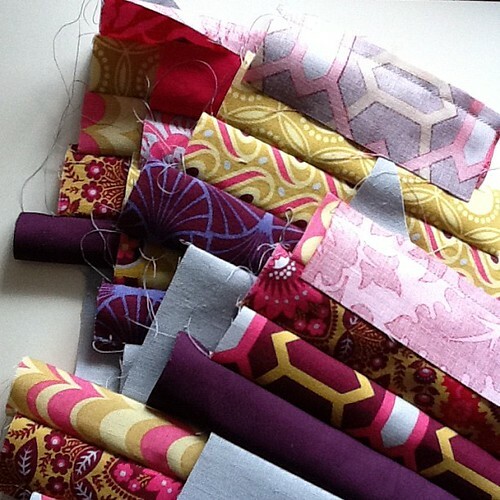 Love the pairing of those delish Heirloom colours with the solids and the linen. Your swap partner is sure to love it. So darn pretty! 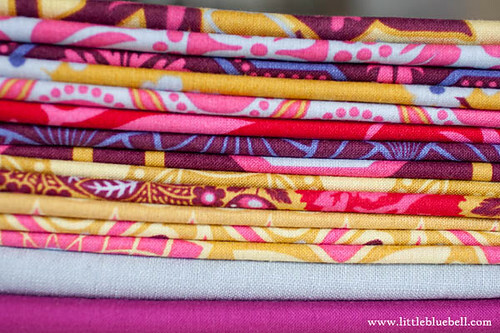 Who wouldn't love those yummy Dewberry fabrics? I would certainly love it if I were your partner! 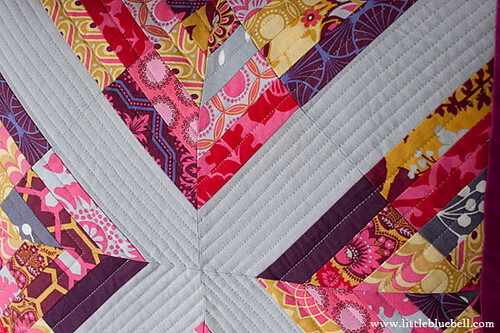 The colors are stunning and I think the quilting is perfect for the pattern!